Byron Bay and surfing. The two just go together — especially if you talk to experienced surfers. The surf breaks here are some of the best in Australia (perhaps even in the world!) with more rights due to the south swell, but you’ll get it all when you come to surf in Byron Bay. But rather than us try to explain it, watch this video of pro surfer Matt Wilkinson talk about what’s it like to live and surf in Byron Bay. Before you head out to surf, be sure to check out the Byron Bay surf forecast. You can use the Coastal Watch, where you can get a live look at conditions, or SwellNet, where you’ll get a chance to look ahead with the surf forecast. The world-class surfing not only attracts regular surfers, but also professional surfers, some of whom have ended up staying forever. You’ll find surfers who turned to producing surfboards like Bob McTavish or Alan Emery, or some up-and-coming young surfers like 26-year-old Garrett Parkes who is hitting his stride and hails from Byron Bay. This video, featuring Garrett Parkes, shows off more of the amazing waves you’ll find here in Byron Bay. Any surfers, both pro and experienced, recommend first timers to take a surfing lesson, not just head out into the water. A surfing lesson is well worth the money and can get you riding the waves before you know it (even on the first lesson). Check out the link below for places that you can hire a board as some of these are schools as well (there are plenty of excellent Byron Bay surf schools in the area) and sign yourself up. You’ll be glad you did. Byron Bay ranks as one of the top 50 places in the world to surf. The beaches here are truly spectacular with warm waters facing three directions – North, East and South. The problem is picking where to surf first. Here are a few of the top choices for surfing. The Pass – The Pass is the most popular of the surf beaches of Byron Bay and has the best break on the North coast. Fisherman’s Lookout is a great place to check out the surf conditions on any given day to see if it is worth catching a wave or moving on to another beach for better options. Dive boats are launched regularly from The Pass, so it is important to keep your wits about you. Wategos – While not as popular as The Pass for surfing, Wategos Beach is also a perfect surfing beach all year round. Check out the local surf and weather reports before heading out as bad weather can cause choppy waters and hot days could calm the swell drastically. Tallows – Not far from Byron Bay proper, this surfing spot offers an alternative to those at the front of town. When the waves are flat there, you’ll often be able to find some great swells here. However, keep in mind, the waves at Tallows Beach often come with strong rips so beginners shouldn’t try out this location unless the waves are very small. Those learning to surf should stick with Main Beach or Clarkes Beach. Suffolk Park – On the way to Lennox Head, you could stop here at Suffolk Park to catch a few waves. The beaches here are unpatrolled so novice surfers should go elsewhere. However, if you know what you’re doing, then you might enjoy the excellent left and right breaks you’ll find at Suffolk Park. Access to this beach is limited so you shouldn’t feel crowded! 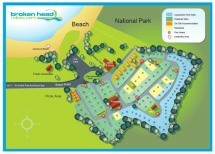 Broken Head – Here you’ll find a mix of families and surfers since it has BBQ facilities and a grassy area to picnic. But the reason surfers keep coming is for right-hand point and beach breaks that can work for both long and short boarders. When the waves are breaking well, word gets out and you’ll see quite a few surfers out there since it can become some of the best barrels in this part of Australia. Keep in mind that the rip around here can be tough, so be careful! Besides just the waves, there are lots of reasons that Byron Bay is so appealing to surfers. The entire culture here is a free-flowing, laid-back attitude that allows residents and visitors alike to feel free to express them, relax and just chill. Here are a couple of videos that showcase Byron Bay. Between the many vegan, vegetarian and clean eating options, in addition to the popular yoga studios, Byron Bay certainly embraces a holistic, healthy culture. It’s a natural magnet for surfers who typically like to eat healthy food and take care of their bodies. Check out our other posts on where to grab a bite or take a yoga class. Besides the waves, culture and good food, there’s the chance to view whales, dolphins, sea turtles and much more when you’re on holiday in Byron Bay. If you are in the area during migration season, there is a chance you could see whales. Dolphins are around pretty much all year — so check out this sea kayaking tour you can do that pretty guarantees you’ll be around dolphins. Go snorkelling for the opportunity to view sea turtles up close. Plus, go hiking in the hinterland and you’ll be able to see even more wildlife. Camping, being that much closer to nature, goes hand in hand with the surfing culture. So if you are coming to check out the surfing and all that Byron Bay has to offer, you’ll want to reserve your campsite at Broken Head Holiday Park. Plus, we’re super close to one of the favourite surfing spots (remember, Broken Head, right?). We have both powered and non-powered beach campsites, depending just how close you want to get to nature as well as beach shacks and more. We can’t wait to introduce you to the Byron Bay vibe!